Green Chawli Leaves recipes | Indian Amaranth Leaves recipes. Amaranth is a popular green leafy vegetable grown all over India. It is usually short-lived, with erect and often thick and fleshy stems and green leaves. Used in dals, parathas and sabzi. Chawli leaves vegetable is a perfect combination with Bajra roti. These leaves make up a good salad and are a wonderful addition to kadhi and Parathas. Try the Chawli Leaves Sukhi Subzi recipe made from amaranth leaves, onions and coconut. Onions helps to build WBC (white blood cells) which serves as a line of defence against illness. The fresh coconut has saturated fats but most of it is MCT (Medium Chain Triglycerides) which promote weight loss. So plenty of reasons to try this easy recipe. Ridge Gourd and Amaranth Shaag Bhaja recipe is a popular Bengali style sabzi where iron rich chawli comes together with ridge gourd which is high in fibre and Vitamin C to make a super healthy sabzi. We have used Amaranth leaves in making the famous Bengali roti. The Chawli Leaves Parota recipe is made healthy by replacing maida with whole wheat flour. Pair this with some fresh curds. Yes, we have a really healthy snack. Try this rajgira buckwheat brown rice flour khakhra recipe made with green chawli and 3 healthy Indian flours. Buckwheat flour is rich in folate and good food for pregnant women. Buckwheat keeps your heart healthy and high in fibre and diabetic friendly. Green Chawli Leaves, Amaranth Leaves : It helps reduce the bad cholesterol (LDL) from the body. Moreover it also has small amounts of potassium and magnesium, the two nutrients which maintains heart health. Chawli Leaves Good for Anaemia. With a whooping amount of 32.2% of Vitamin A, chawli leaves can in truth work towards improving vision. It’s the fiber found in amaranth leaves which is good for the gut and constipation. See detailed benefits of chawli leaves. 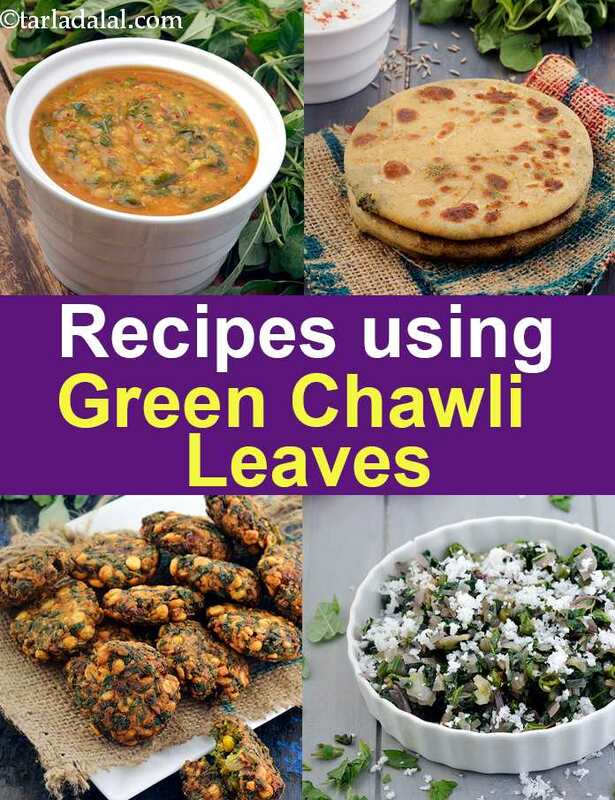 Enjoy our Green Chawli Leaves recipes | Indian Amaranth Leaves recipes below. A simple and ready-in-a-jiffy recipe. Avoid cooking it on a high flame or for a long period as this will cause discolouration and loss of flavour. Green tandarjo Muthia and tomato curry is a Gujarati Jain vegetable recipe with the steamed green muthias simmered in a tangy and spicy tomato curry. The methi and tandarjo are chopped and added to the Muthia dough and then relished with tomato curry and rice. This kadhi has lots of vegetable ingredients. As per the taste palate it can be made spicy, tangy or a bit sweeter too. Diced vegetable pieces add to taste! Amaravathi is a traditional lentil or dal recipe with the dal cooked with greens like methi, spinach, coriander and mint along with garlic paste, tomatoes and onion. Enjoy this flavoursome and iron clad dal recipe, amaravathi with steamed rice, garnished with coconut scrapings. Flat Bajra dumplings in vegetable made out chawli makes Bhaji Dhokli completely different from the original dhokli.